Home News Could Narrowing Liberty Street Unlock New Development Potential in OTR? Streets can set the mood and feel of a place. Narrow streets with low traffic are quiet, easy to walk across and casual. Wide streets can be chaotic, full of traffic and hard to bridge on foot. There is a wide street in Over-the-Rhine that cuts through the northern part of the neighborhood and the southern revitalizing part of it. It’s Liberty Street. Liberty Street was not always so wide. Before 1955 the street, which now dead ends at Reading Road and the I-471 ramps, extended from Highland Avenue on the hill in Mt. Auburn to the U.S. Post Office facility in Queensgate. The width of the street was a modest 25 feet. In 1955, however, the city decided to widen and connect it to Reading Road as a east-west cross town access point for the interstate highway system. Buildings on the south side of the street were demolished and the street was widened from a two lane road to one with five lanes. The street is currently 70 feet wide and is both dangerous and difficult to cross for people walking. Development has not taken place on the south side of the street since most of remaining lots are too small and oddly shaped for development. Beyond its physical barriers, Liberty Street also serves as a psychological barrier between the nascent Brewery District and vibrant Gateway Quarter. In 2012, the City’s Department of Transportation & Engineering began studying ways to calm traffic on the street in order to make it safer. After spending two years evaluating traffic conditions, City Hall is beginning to engage the public for comment on the proposal. The first will be tomorrow night at the Woodward Theater. 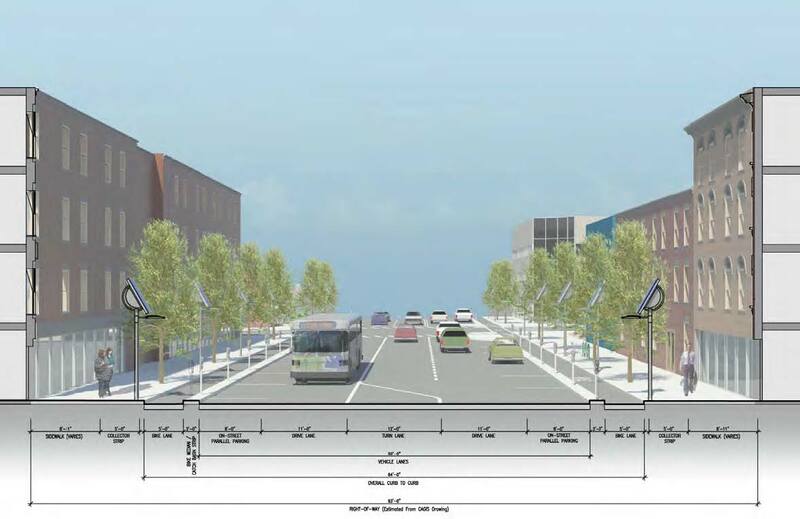 The session will build upon the idea proposed in the OTR Brewery District Master Plan, which called for the removal of a lane of traffic to add protected bicycle lanes in both directions. The UrbanCincy team recently discussed the proposal and found that while this is a good starting point, there is a larger opportunity for the street to spur more redevelopment along the corridor. Our proposal eliminates one lane of traffic in each direction, but preserves the middle turn lane. A two-way contraflow protected bicycle lane would then be installed on the south side of the street. This leaves approximately 15 feet of unused street right-of-way. This unused right-of-way could be returned to property owners on the south side of the street, thus narrowing the overall street by 15 feet. It would also increase the size of the southern properties which would increase their development potential and improve safety for pedestrians crossing the street. This would serve as particularly beneficial for small parcels such as those at the corner of Vine and Liberty or between Main and Sycamore. This idea builds on the ideas put forward by Jeff Speck, who recently released a video on traffic calming and embraces modern street design standards that are found in the National Association of City Transportation Officials Street Design Manual. The Liberty Street Safety Improvement Open House will take place at the Woodward Theater located at 1404 Main Street in Over-the-Rhine. The session starts at 6pm and will last until 8pm. It is served by the #16, 17, 19 and 24 Metro bus routes, and is less than a block away from a Cincy Red Bike station.